Hello to everyone out there, divers and non divers alike! Another wonderful trip has just finished on board the Nautilus Explorer, after we visited the islands of San Benedicto, Socorro and Roca Partida. All the guests are full of energy and great enthusiasm because of the huge variety of marine life in this area! 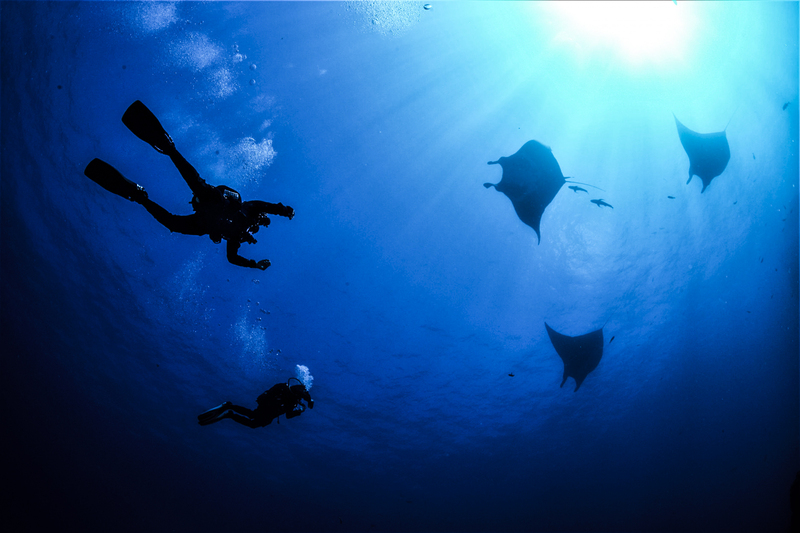 The mantas were so playful and we had close encounters with them. 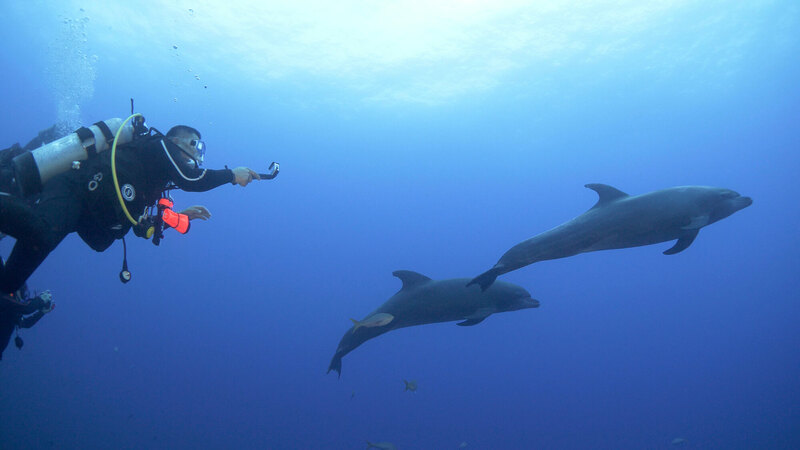 The smiling dolphins were so nice to let us swim with them. The sharks! Galapagos, Silkies, Tigers, Hammerheads, white tip reef and Mister Big, the great whale shark just passing by. The small marine life also so colorful and it is nice to see them too. The water conditions were sometimes a bit wavy and sometimes calm, with moderate current and temperatures between 73°F to 75°F. We have a diver from Austria celebrating 1000 dives with us!! As well as happy couples from Hawaii, Germany, Switzerland, and USA, but the extra special ones are the happy honeymooners who had a very nice time diving with us. As always safety is number one onboard and we keep practicing our firefighting drills. There is something any camera will never be able to photograph. We were sailing by night towards Cabo San Lucas during the “Red Moon” which came to wash away all the rough weather we had during the week. We gathered at the bow and sundeck of the Nautilus Belle Amie and watched the eclipse for hours. When suddenly a pod of dolphins joined us, as we looked down we could see the waves breaking at the bulb and creating the magical bioluminescence! As the dolphins swam next to us we could see the trail of plancton shinning behind them! Some people say we were saving the best for the last, but honestly this is just 1 out of 100 moments you will get to see when visiting the Socorro Islands with the Nautilus Fleet! 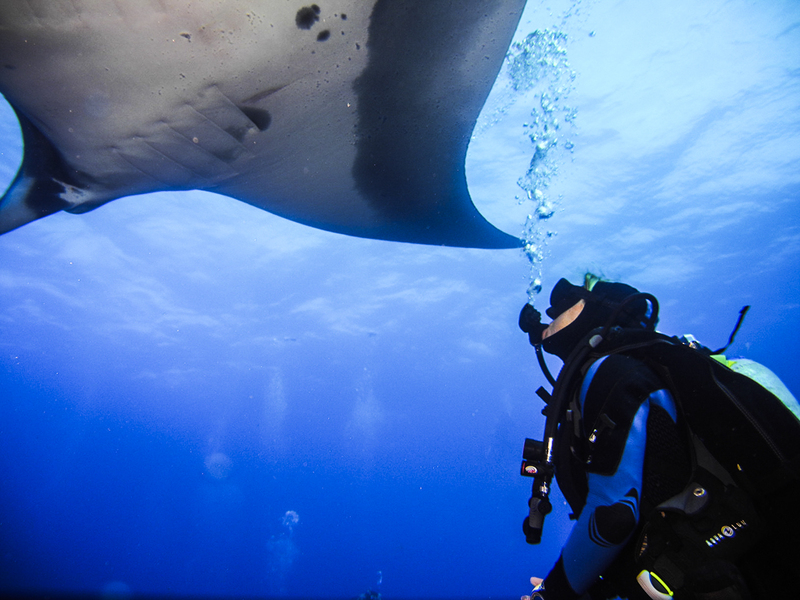 We just had another fantastic trip to Revillagigedo!! The marine life was insane! 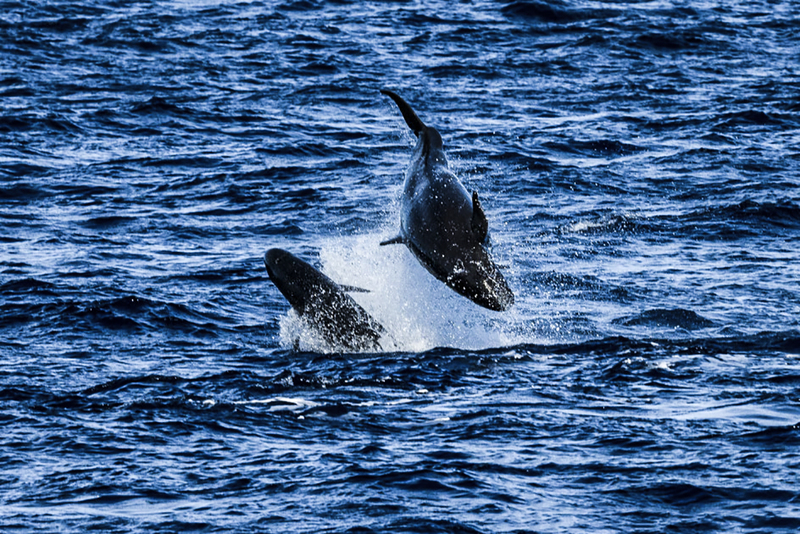 Schooling hammerheads at Punta Tosca, a Tiger shark at Roca O’Neal, 8 Giant Mantas in one dive at the Boiler and an awesome surprise at Roca Partida when a pod of about 60 False Killer Whales swam by the Explorer. The skiffs were just coming back from “the Rock” so all the guests were still in their wetsuits and got a chance to dive out and swim with the pod in it’s natural habitat. There were several groups of adults swimming relaxed by the surface and coming up for air and groups of juveniles playing and jumping out of the water. One guest even had a drone and could follow the pod for a bit and that’s when we saw how many there were and what behavior they presented. Another great day at Roca Partida!! One more trip begins it 6.00 am here at San Benedicto Island and everybody starts to wake up and prepare for the first dive of the trip in el Canyon. The Sun is starting to rise and we will have a beautiful sunny day with calm seas. All the guests are really excited about what they are going to see and the divemasters are too! Here at el Canyon you can find everything. Last week we had schools of hammerheads, a tiger shark, silvertip sharks, Galapagos sharks and mantas!!! This moment before the first dive you can always feel the excitement around. I love that feeling! Keep reading if you want to know what wonderful marine life we will see on this trip. This is all for the moment from the Nautilus Explorer. Tuna hunting again at Roca Partida today! Seems like this time of the year is like carnival for them, the tunas can change their coloration on their body; shinning dark stripes over their gold yellow skin, chasing themselves like crazy amongst the divers! With the Nautilus Fleet you can experience the wildest moments of the Socorro Islands with safety and excellence in guest service. By the end of the last dive our divers still had time to whale watch from the panga as the sun went down with a bucket of cold Mexican beer! Get away from the winter and enjoy a week of nature and good friends on the Nautilus Belle Amie! Amazing diving today at Roca Partida. Some hammerheads, a whale shark at the dive site and also a whale shark around the boat the whole entire day. There was also an amazing family of Humpback whales breaching and flapping their tails and pectoral fins all around the boat. The whales are getting closer and closer to the dive site at Roca every time, hopefully in time we will get to see them while diving! It’s sunrise at Roca Partida and the Explorer is already busy with divers getting ready, a dive briefing about the site and marine life and some last minute coffee mugs getting drunk. We’re headed out for an early morning dive at 7am. And it was so worth the early start!! As soon as we descended we see several 2 meter yellowfin tuna still chasing for their breakfast and terrorizing the Creole fish and Cottonmouth Jacks. They seem so busy with their hunt they don’t mind us at all and pass many times just feet away. The prey fish pack tightly together for protection and we can swim trough the schools! Mantas are also numerous this morning around “the Rock.” The first one passes by along the west side and then we see 3 together in the north dancing just under us! The fact that the water is crystal clear makes all the action even prettier. 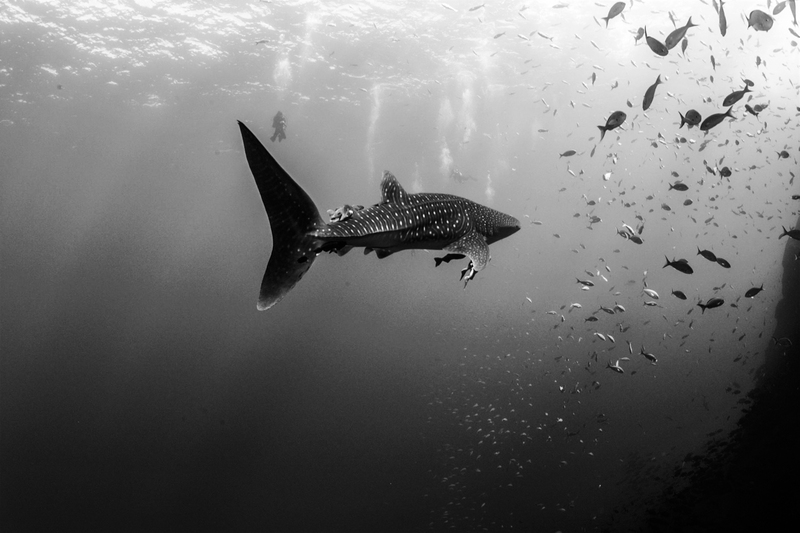 As we finish our dive in the north we leisurely hang in the current and observe Galapagos and Silvertips around us and just before we want to start our ascent I spot some white shadows passing a bit further out. We swim there and sure enough, at only 20 meters depth there is a group of 9 Hammerheads cruising past. They are very relaxed and let us come very close without getting scared! What a treat!! An amazing day at Roca Partida is just starting!! Today was a first for me. After three and a half years of working at Nautilus, I finally dove with a whale shark. Usually my encounters consist of jumping off the back deck fully-clothed in my uniform with a mask and snorkel before the whale shark swims away lasting only a matter of seconds. Finally, today, that changed with a close encounter! We all come to these islands in the middle of nowhere because of the incredible life that is under the water, but this luxury of marine life contrasts strongly with the beautiful desolation that you can see on the islands. The view of San Benedicto from our boat is incredible, we can appreciate the magnificent and perfect cone shape of the volcano and the hole in the base of that cone where the lava of the last eruption broke and flow into the ocean. There is nothing alive that you can see, not a single plant and that is something that us the humans are not used to seeing, a place so desolate that it makes us think about other worlds, maybe the Moon or Mars! And the view is even better when you can fly over the islands and have a bird’s eye view. I leave you with a picture this time from out of the water. Good night from the Nautilus Explorer on our way to Roca Partida! Amazing conditions at Roca Partida today! Flat sea, no wind and great visibility. “The Rock” is surrounded by mammals including a mother and calf Humpback whale and most likely another male around but separated, a pod of dolphins that were skittish but curious enough that they came and checked out the divers during the third dive of the day. Schooling tunas are back and bonitos. Then hammerheads, a school of 40, as well as big Galapagos sharks and Silvertips packing up jacks and trevalis! 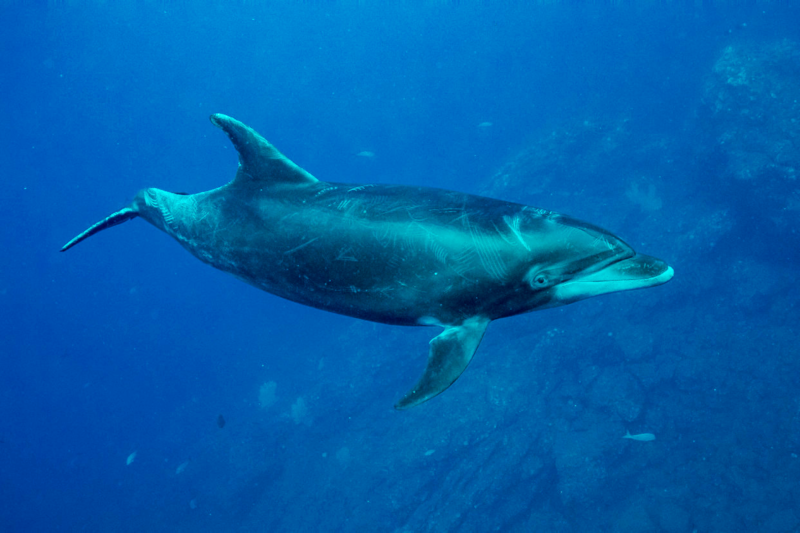 Today we dove “The Boiler” where we had a great time with dolphins and mantas! 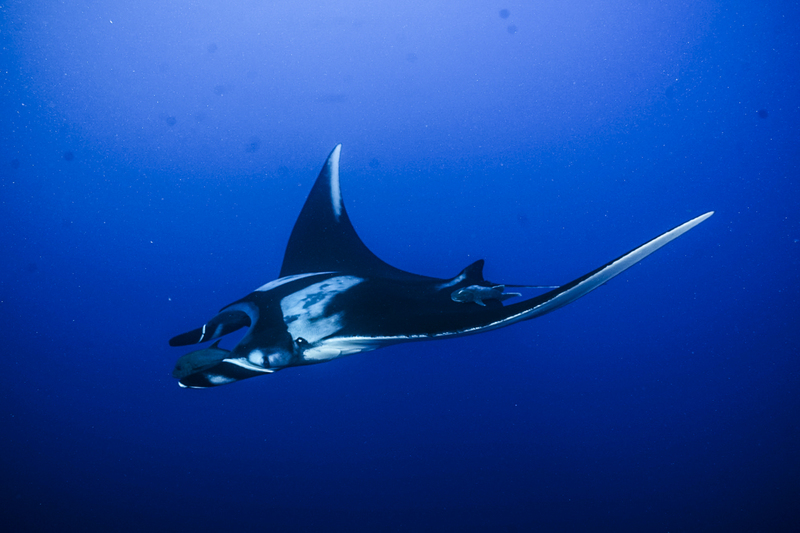 We also had the opportunity today to have a close encounter with the mantas! It was a long wait, but totally worth it. Another fun trip with great people from all over the world on the Nautilus Undersea.